What Exactly Is The MelaLuna? “MelaLuna” is a dietary supplement that’s formulated with a blend of calming herbal extracts, nutrients, and vitamins to help you sleep faster, longer, and better, without side effects. It also relieves stress and anxiety and improves focus and energy. Melatonin – This is a hormone that’s naturally found in the body. It’s often available as an over-the-counter supplement, which is taken by people with insomnia. Valerian extract – This is widely used for treating sleep disorders, such as insomnia, and psychological stress. Passion flower – Some people take this orally for anxiety, nervousness, insomnia, pain, and attention-deficit/hyperactivity disorder (ADHD). Chamomile flower – Chamomile is a mild tranquillizer and sleep-inducing herb. That’s why it has been used for treating insomnia and easing anxiety for years. Lemon balm – This is often used alone or in combination with other herbs for treating anxiety, restlessness, and sleep problems. L-Tryptophan – This is a type of amino acid that interact with certain chemicals in your brain that play an important role in sleep and sleep-wake cycle. You can buy the MelaLuna sleep aid supplement per bottle or in bulk (“3 bottles + 1 free bottle” package and “5 bottles + 3 free bottles” package). Each bottle contains 60 capsules. The manufacturer recommends taking this supplement 1 to 2 hours before you plan to sleep. As you can see, this is just an overview of the MelaLuna. You can find more details about the main ingredients here. Of course, this doesn’t mean that this supplement is automatically safe. However, if you want to pump less synthetic chemicals into your body, this would be a good option for you. Most of the ingredients used in the MelaLuna doesn’t cause symptoms of dependence and withdrawal, unlike other sleep meds. So far, we haven’t read any reports of people building tolerance or addiction to it. However, to be on the safer side, make sure to consult your doctor before, during, and after taking this sleep supplement. The ingredients used in making the MelaLuna sleep aid supplement don’t just give you longer and better sleep. For instance, chamomile is often used for treating colds, muscle cramps, stomach aches, and menstrual pain. Meanwhile, Valerian has been used in alternative medicine for treating anxiety, stress, tremors, symptoms of menopause, and chronic fatigue syndrome (CFS), among others. 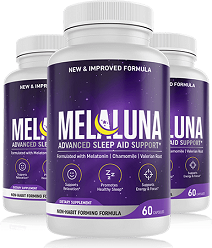 At the moment, only U.S. residents can purchase the MelaLuna sleep aid supplement via the official website. Just because the MelaLuna uses natural ingredients doesn’t mean it’s completely safe. Each ingredient could still have a few side effects. For instance, melatonin could cause dizziness, stomach discomfort, grumpiness, temporary depression, and daytime sleepiness. Valerian root could cause dry mouth, upset stomach, strange dreams, feeling of uneasiness, and daytime drowsiness. Reminder: Always consult your doctor before taking any dietary supplement for sleep. There’s a ton of things you can do to get more quality sleep every night. It’s important to exhaust these non-pharmaceutical remedies before taking meds or dietary supplements for sleeping problems. – Established a fixed schedule for sleeping and waking up each day. – Avoid drinking stimulants, such as alcohol and caffeinated drinks, 4 to 6 hours before bedtime. – Exercise regularly to improve the quality and duration of your sleep. – Don’t take too many naps because they can affect the quality of your nighttime sleep. – Use your bedroom for sleeping only. Avoid doing other activities, such as watching television, playing games on your phone, or listening to the radio, in your bedroom. – Create an environment that’s conducive for sleeping. – Don’t go into your bedroom, unless you’re really sleepy. – Find ways to relax your mind and body. For example, you can meditate, perform breathing exercises, and listening to soothing music. With that said, if you’ve already tried almost all treatments and strategies for sleep problems, if you want a sleep supplement that uses natural ingredients, or if you simply want to avoid withdrawal or dependence problems, then the MelaLuna sleep aid supplement is a great option for you to consider. Well, that’s it for this MelaLuna review. We sincerely hope you find this informative. Click Here to Learn More About The MelaLuna Advanced Sleep Aid Support, And Check Out the Special Discounted Prices That Are Currently Available Online!